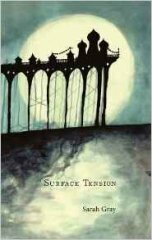 Surface Tension is a unique collection of dark tales which delves deep into the undercurrents of human psychology. Ghosts, heavenly creatures and magic-beings haunt the characters, bringing messages of warning or redemption. They're delightful stories that charm and scare in equal measure. As a television editor turned writer/director, Sarah Gray has worked on hundreds of programmes and written and directed her own short films. Her education is in literature and writing, for prose and screen. Sarah's focus is on short stories and she delights in both supernatural and comic genres. wanderingthroughbooksandwords blog: This book is a unique tale of stunningly brilliant short stories, I found myself hooked to the page reading each and every one.